Produced in the Provence region of France, an are we normally associate with lavendar and sunflowers. But add to that image merino sheep! These tops are made from carefully farm sorted and graded fleeces. Our supplier travels to the farms to personally sort the wool before sending it off for scouring and combing, ensuring you're getting the very best of quality. 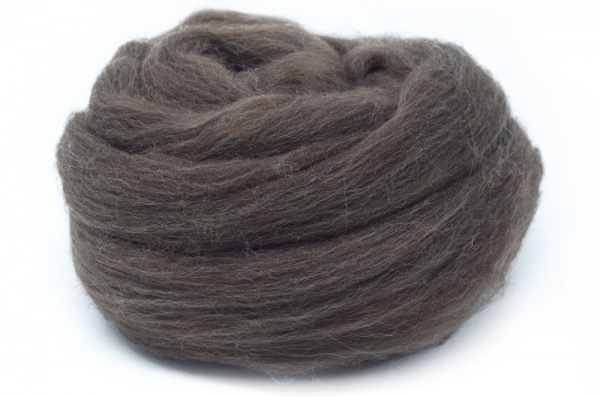 This merino is a high bulk 23 micron, giving it characteristics different to ordinary merino. When spun it will give a nice bulky yarn and for feltmaking the 23 micron is a good felting wool with an interesting colour. Many of the sheep from the smaller flocks are taken by shepherds in the hot summer months on a 5 day walk into the mountains, the "transhumance", an old traditional practice. For those who look at the airmiles that merino normally travels this French alternative is the shortest distance that any of our merino travels.